자연을 벗삼아 쉼터로 사용하고자 지은 피향정은 호남지방에서 으뜸가는 정자 건축이다. 통일신라 헌안왕(재위 857∼861) 때 최치원이 세웠다는 이야기가 있지만 지은 시기는 확실하게 알 수 없다. 기록에 따르면 조선 광해군 때 현감 이지굉이 다시 짓고 현종 때 현감 박숭고가 건물을 넓혔으며, 지금 크기로는 숙종 42년(1716) 현감 유근(柳近)이 넓혀 세웠다고 한다. 그 뒤에도 몇 차례 부분적으로 고쳤는데 단청은 1974년에 다시 칠한 것이다. 규모는 앞면 5칸·옆면 4칸이며 지붕은 옆면에서 볼 때 여덟 팔(八)자 모양을 한 팔작지붕이다. 지붕 처마를 받치기 위해 장식하여 짜은 구조는 새 부리가 빠져나온 것처럼 꾸민 형태로 간결한 구조를 하고 있다. 건물 4면이 모두 뚫려 있어 사방을 바라볼 수 있고 난간은 짧은 기둥을 조각하여 주변을 촘촘히 두르고 있다. 건물 안쪽 천장은 지붕 재료가 훤히 보이는 연등천장이지만 천장 일부를 가리기 위해 건물 좌우 사이를 우물천장으로 꾸민 점이 눈길을 끈다. 또한 이 누정을 거쳐간 시인과 선비들의 시가(詩歌)를 기록한 현판이 걸려 있어 건물의 품격을 더하고 있다. 조선시대 대표가 되는 정자 중 하나로 조선 중기의 목조건축 양식을 잘 보여주고 있어 건축사 연구에 중요한 자료가 되는 문화재이다. 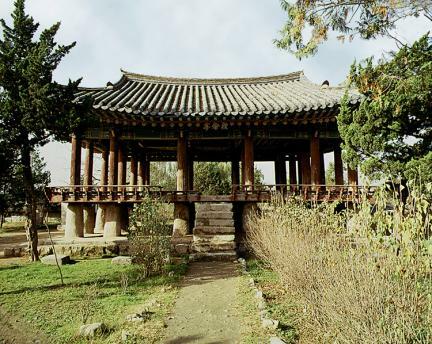 In harmony with the surrounding nature and designed to serve as a resting place, the Pihyangjeong Pavilion is regarded as the most beautiful pavilion in Jeolla-do. 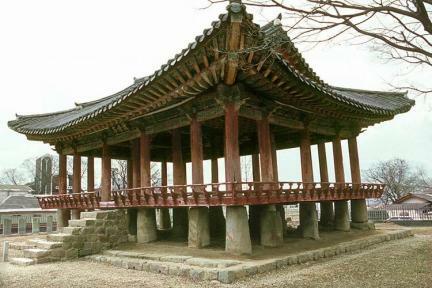 It is believed to have been built by a person named Choe Chi-won during the reign of King Heonan of the Unified Silla Dynasty who ruled between 857 and 860, but the exact year of construction is not known. 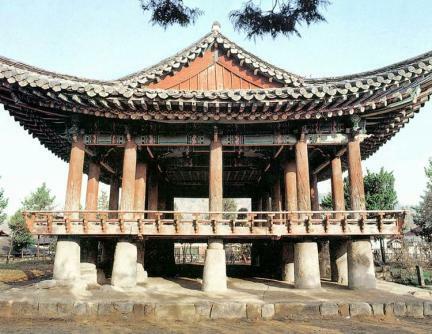 However, records show that it was rebuilt by a County Headman named Yi Ji-gwoeng during the years of King Gwanghaegun of Joseon and expanded by another County Headman named Bak Sung-go during the reign of King Hyeonjong. 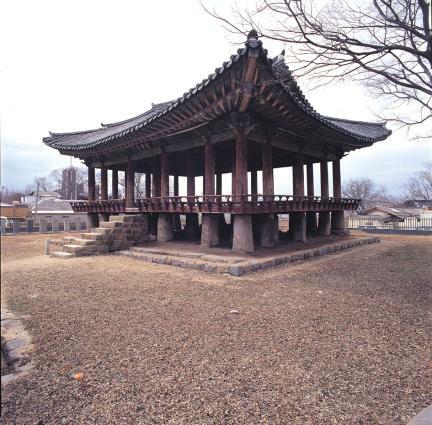 Years later, their successor Yu Geun further expanded and rebuilt the pavilion to the current size in 1716 (the 42nd year of King Sukjong’s reign). 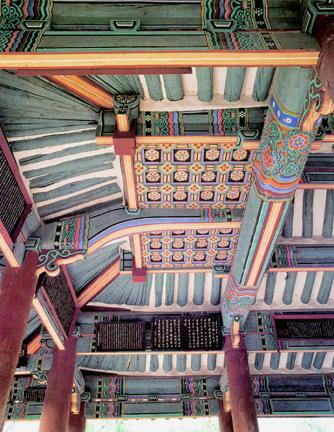 The pavilion has been through a number of minor repairs since then, including a new paint job in 1974. 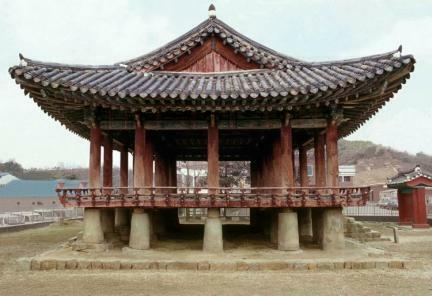 The structure measures five kan (a unit of measurement referring to the distance between two columns) by four kan under a hip and gable roof. 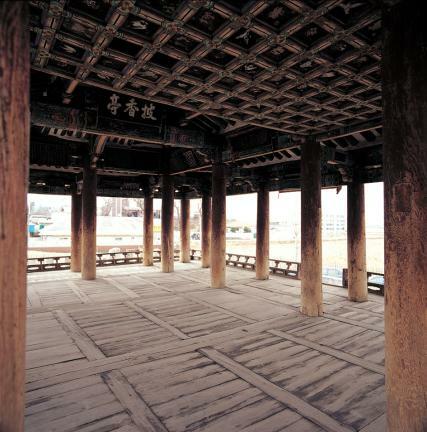 It is a simple winged style of building with gongpo (pieces of wood inserted between the rafter and column) on the top of the supporters to support the weight of the roof. 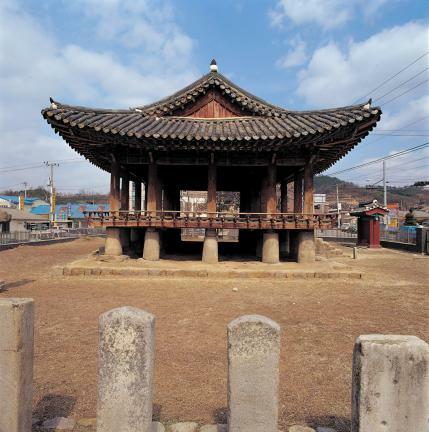 There are no walls to hinder the view, and the floor is surrounded by a wooden handrail that’s supported by short carved columns. 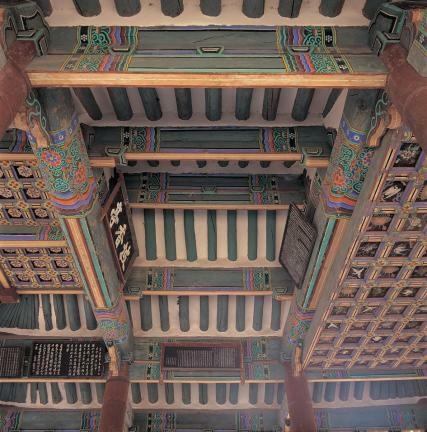 The ceiling reveals the rafters since it’s mostly not covered, with the exception of some cover panels. 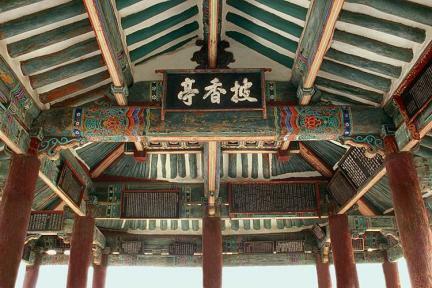 Another unique feature of this pavilion is that there is a hanging board with a record of poems left by poets and scholars who have visited this pavilion. 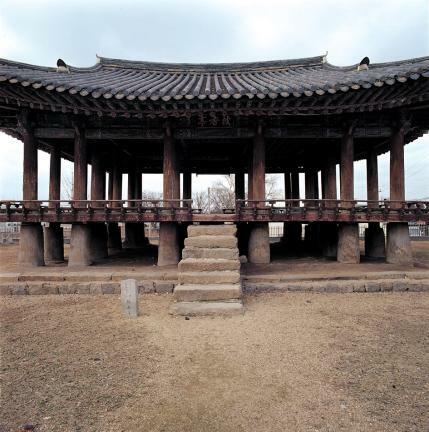 As one of representative pavilions of the Joseon Dynasty that shows well the architectural style of the middle Joseon Dynasty, this pavilion serves both as an important cultural property and material for studying the architectural history of Joseon.